I’m now experiencing my father of 51 years in snapshots and sound bites so bittersweet they have been stopping me in my tracks at unexpected moments. Dad had a zest for life and an evangelical passion behind everything he did. If he loved something, he wanted to share it with everyone around him. Growing up on Long Island Dad exposed all of his children to the culture that Manhattan offered. He took me to fancy restaurants where he would order his then signature drink, a perfect Rob Roy straight up with a twist and me a Shirley Temple. We went to the theater, the ballet, museums, and even though I was young, I think I instinctively knew that he wanted to instill in me an appreciation of the things that mattered to him. And it worked. I remember when I was at boarding school he sent me a rather generous Amex giftcard. I chose to take my roommate to The Russian Tearoom in Manhattan, a place I had been to with him before. I felt so sophisticated, so privileged at being able to do this. She and I will never forget that meal. On Sunday mornings Dad would sneak out of the house and partake in a weekly and mysterious ritual, a hunting and gathering of sorts that resulted in something akin to a Jewish Harvest. Instead of gourds and dry corncobs on our kitchen table there appeared heaps of bagels, lox, cream cheese and chives, whitefish and creamed herring. This essentially gave us a good reason not to interact with the outside world for the rest of the day as our fishy breath would scare off even the strongest of men. This food, given the choice, would be the main components of my last meal. On only a handful of occasions I’d wake up to the smells and sizzling of Dad cooking in the kitchen. I’d come downstairs and see him, standing over slabs of perfectly rectangular patties, spatula in hand, the blue can with that I icnonic name off to the side—SPAM. I can’t remember him cooking anything else, but, let’s face it, his mother Evelyn was no Barefoot Contessa. He explained the history of it, something about rations, giving me some sort of justification for this diversion from his more public standards. 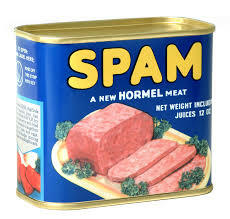 I’m not sure where it was kept hidden in our house and even though Spam is really just a salt lick in a can, it is rather delicious. Dad, there is no shame in Spam. We all know that Dad was a brilliant man who was a seeker of knowledge until the end. I can still picture the bookcase in the den where we lived on Long Island, the titles on the colored spines. Many of them made the journey to California with him, and I have smiled at those familiar titles just relocated to another shelf. Not only did he instill a fierce love of reading in me, but for years he sent my daughter boxes of books from Amazon that he handpicked from the young adult New York Times bestseller’s list. Her bookcase is now overflowing with those choices. Dad was also a writer. About once a month he would creep down to our basement to write a column for a highly respected industry publication. This “column writing” was a big mystery to me since it was done deep in the bowels of our house, a place where I hardly ever went. We knew not to bother him until there was an equivalent of an all-clear sound. All of Dad’s children are excellent and expressive writers. He would be so happy to know that when my daughter Amelia spoke to him for what would be the last time, upset and moved by hearing his very weak voice, the first thing she did afterwards was scramble around for her journal and pencil so she could write down her feelings. When it came to learning, we weren’t allowed to be lazy. When I would ask what a word meant, instead of telling me the definition he would insist that I look it up. When I said I was bored, he would say, “Read a book,” the same thing I say to my daughter now. When I was in my senior year at boarding school in Mass, the one and only time I got a D on a report card, I was so nervous that I asked my stepsister to throw it away when it came in the mail. I don’t know if that actually happened but it’s the story I’ve been telling ever since. In case you hadn’t heard Dad LOVED Syracuse University. I am a proud graduate, my nephew Ryan is, and his granddaughter Zoe is. At least once a year he would ask me, “So Gayle, do you think your Syracuse education prepared you for the world?” or “Did you enjoy your time at Syracuse?” I would say, “yes Dad, yes Dad” and it did (so, I was a journalism major and now I work with recovering drug addicts—but I’m excellent with writing about addiction!) I just loved that he was so happy that I was quite literally walking in his footsteps. The year before I graduated a brand new Student Center was built. I knew Dad had made a significant enough donation to have a small room named after him. It was not an easy call to make to tell him that I had just stumbled upon the room he had named and it was the new meeting space for the Jamaican Student Society. When I rescued my first dog, a pitbull right before my daughter was born, the articles became about pitbulls who bit off children’s faces. My pitbull happened to be so fat and lazy that she could hardly move and didn’t have a mean bone in her body, unless you happened to be wearing a hat and sunglasses. And, when I started working with inmates, I would get lovely articles about how the type of work I was doing made a huge impact. He was proud. The best part about getting letters from Dad, and Dad wrote a LOT of letters, was this little self-portrait. I miss his sloppy cigar kisses. Dad had let’s just say, some less “refined” passions where he was equally as authentic. He turned into a complete stranger at Rangers games when, holding a cheap plastic cup of beer he would scream at the top of his lungs at a ref who he thought had made a bad call “You bum! BOOOOOOOOOO” Then, on the way home on the train, I would laugh as he would fall asleep, head tilted backwards and snore, apparently exhausted from these bursts of a different sort of passion. One of my absolute favorite memories of Dad was him sobbing into a couch pillow after watching “The Champ.” So, yeah, I cried too, but boy did we laugh at ourselves for our crying. When Dad moved to LA, undoubtedly wearing plaid polyester pants and a mismatched polyester shirt, he embraced his new homelike he did everything else. He would call from his car phone on the way home from work, practically giggling that it was even possible to do so in the first place, and use the word “glorious” a lot to describe the weather and his new surroundings. “Gayle, I’m making my way up Beverly Glen on this glorious day and I’m talking to you from a phone in my car!” He had left his beloved Rangers in the dust and got season tickets to the Kings. He discovered his new favorite restaurants, and met his partner for life. Mickey, Mark and Donna, my amazing siblings, there is a huge piece of Dad embedded in all of us. We are outgoing, confident and really funny. He was proud of each and every one of us. His grandchildren are all of those things too. That doesn’t come from just anywhere.